What an exotic name!! And it sounds so mysterious! 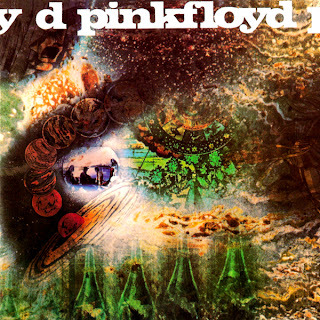 Did you know that "A saucerful of secrets" weren't the original title??? They originally called it "The massed gadgets of Hercules". I reckon it's fancy too, but I'm glad they choose the title they did. As you might know, this is a instrumental piece, and it's also the title of Pink Floyds second studio album. The album is just as great as the song, and written by Roger, David, Nick and Rick. The cover to "A saucerful of secrets"
The song contains four parts. The first one is called 'Something Else', the second part is 'Syncopated Pandemonium', the third part is 'Storm Signals' and the fourth and last part is 'Celestial Voices'. The piece suggest of human development: Birth, adulthood, death and re-birth. I will put out a video with this song from "Live at Pompeii", and when David Gilmour start to 'sing' at the end, it feels almost magical! If I ever get re-born (don't know what to believe), but if I do, I hope it feels as good as it does to listen to this song! This is the absoulute best version of the song!! Oh my god, I almost get tears in my eyes everytime I listen to the last part (re-born-part). The song itself is powerful, and if you can't feel anything while listening to this song, well.. that's not good! I feel sadness, hapiness, confuseness and all the other feelings that ends with 'ness'.